The new CD is finally completed! We had an amazing working with many special guests and friends new and old. Can't wait for you to hear the results. The official release date is January 15th, 2007. HOWEVER for our friends and fans, we will have the CD's available for sale at performances on the web and by mail order by mid December. In pre-Civil War years, Black gospel spirituals often served dual purposes - to assert hope for a better life and to convey coded directions and advice to runaway slaves heading north on the Underground Railroad, a network of sympathizers providing food, shelter and aid. Many of these same songs became anthems of the Civil Rights movement of the 1960s, their messages of faith and determination stoking freedom marches and rallies. Since 1982, the married folksinging duo of Kim and Reggie Harris has been exploring the rich lore of Underground Railroad stories and songs and their subsequent reuse in more modern contexts. The Harrises' 1997 Appleseed CD, "Steal Away: Songs of the Underground Railroad," was proclaimed "a stunning recording" by Sing Out! magazine and has been embraced as a teaching tool by Underground Railroad and Black history museums, freedom centers, and school systems. On the new "Get On Board! 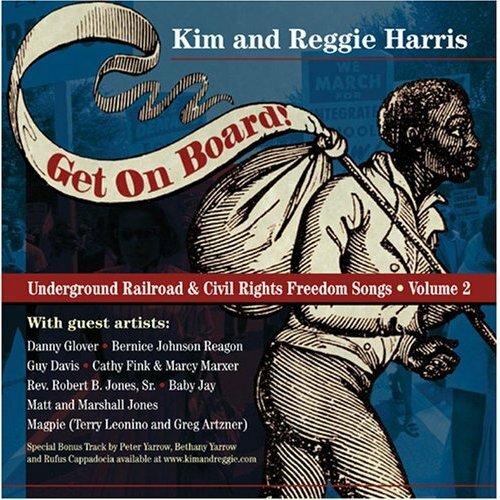 ", Kim (vocals) and Reggie (vocals, guitar) present some of the lesser-known Underground Railroad songs they've uncovered, revive several standards from their past recordings and mix in newer compositions "Ballad of the Underground Railroad," co-written by Black history scholar Charles L. Blockson, Cathy Fink's spirited "One Little Step Towards Freedom," and Roberta Slavitt's aching "Freedom is a Constant Struggle." The Harrises' guests on "Get On Board! ", spanning ages and genres, include Bernice Johnson Reagon, renowned musician, teacher, activist and founder of Sweet Honey in the Rock; actor Danny Glover; contemporary folk-blues performer Guy Davis; Matt and Marshall Jones of the SNCC Freedom Singers group of the '60s; 14-year-old rapper Jonathan "Baby Jay" Gutierrez; acclaimed folk duos Cathy Fink & Marcy Marxer and Magpie, and many others. Prominent among the CD's glories is the use of voices - Kim's radiant mezzo-soprano and Reggie's high baritone appear in innumerable harmonic combinations, swooping around each other, slipping in and out of unison, joyfully welcoming the additional vocal textures of their guests. The vibrant arrangements and the fascinating background of the songs, described in the CD's liner notes, make "Get On Board!" an accessible and uplifting documentary of music's role in our country's history. Kim and Reggie Harris will never be confused with the legions of navel-gazing singer-songwriters who fall into the category of "contemporary folk music." The Harrises have been "walking the talk" for over 30 years, performing modern and historically oriented songs exploring societal ills and proffering positive social messages on stages from Italy to Alaska to the Virgin Islands, in classrooms and auditoriums across America, and on 11 albums (the six most recent on Appleseed) and various compilations. Born and raised in Philadelphia, Pa., both Kim and Reggie were exposed to a wide range of music through their childhoods. After meeting at summer camp in 1974, the duo continued their friendship that fall at Temple University. As their personal relationship deepened, they began combining their voices and Reggie's acoustic guitar playing in performances at local Philadelphia clubs and coffeehouses. Married in 1976, the duo began a touring schedule that has averaged more than 200 yearly appearances across the country for the past 25 years, with about half of those performances presenting historically-oriented workshops on Underground Railroad songs for students, educators and parents. Writing songs separately, together, and with other musicians, the Harrises' compositions have addressed politics, domestic violence, families, the rewards and pitfalls of love, and a constant underlying theme of social activism. Their tribute to automobile seatbelts, "Passive Restraint," has been featured on National Public Radio's syndicated "Car Talk" program (and can be found on their "Rock of Ages" CD on Appleseed). With an additional repertoire of spirituals and freedom songs drawn from their cultural background and ongoing studies, Kim and Reggie's music carries on the folk tradition of preserving important songs from the past and incorporating meaningful new songs. The Harrises have long held a special affinity for the songs of the late Phil Ochs, the Sixties singer-songwriter who exemplified the social conscience of the era's musical protest movement. Kim and Reggie are mainstays of a group of musicians who have toured the country for the past 16 years keeping Ochs' music alive in a series of Phil Ochs Song Nights. Ochs' "What's That I Hear" was recorded by the Harrises on last year's "Let My People Go! A Jewish & African American Celebration of Freedom," a joint CD with Rabbi Jonathan Kligler that compared the story of the Jewish exodus from Egypt in the 13th Century B.C.E. with the African American struggle for equality in the mid-Sixties. Kim and Reggie have composed and arranged music for television, radio, video and multi-media presentations. As part of their ongoing work in education, they are presenters for the Kennedy Center for the Performing Arts touring workshop program, providing teacher training that encourages the use of arts in the classroom. Among other high-profile appearances, Kim and Reggie have performed at the opening of the National Underground Railroad Freedom Center in Cincinnati, at the Kennedy Center, Smithsonian Institute, the Philadelphia and Falcon Ridge Folk Festivals, and the International Children's Festival. Most recently, Kim has earned her Master of Divinity degree at New York's Union Theological Seminary, where she now lectures, and is working as an adjunct professor at the College of St. Rose in Albany, NY, and as an artist in resident for the New Brunswick Theological Seminary in New Jersey. She has also become involved in Operation Respect, a non-profit organization founded by Peter Yarrow that works to assure children a safe, compassionate climate of learning where their academic, social and emotional development can take place free of bullying, ridicule and violence. Meanwhile, Reggie continues his volunteer work as a basketball coach and youth mentor in the Harrises' upstate New York community. Here is a link back to Kim & Reggie's home page.